Are you tired of looking for a sensitive and precise stylus to help you to finish works on your capacitive touch screen devices? One has stylish style and looks beautiful and impressive? YH DIMENSION's DISC TIP STYLUS PEN will become your best choice! Compatible with all capacitive touch screen devices, including iPhone, iPad, Galaxy, Kindle Fire, and capacitive touch screen cell phone smartphone, 2 in 1 laptop computer. ✏️PRECISION ACCURACY SENSITIVITY: The transparent disc allows you to see where you exactly point the tip at. The fine point in the center of the clear disc, which is made from excellent conductive material, presents high responsiveness. Real pen feeling. Perfect for all-purpose uses, especially the precise operations. Handwriting, make marks notes, sign annotate documents, gaming, drawing, sketching, painting. ✏️COMFORTABLEC & EASY TO USE: Nicely weighted pen body with well-designed size allows you to hold it with more easiness, comfort, balance, and control. 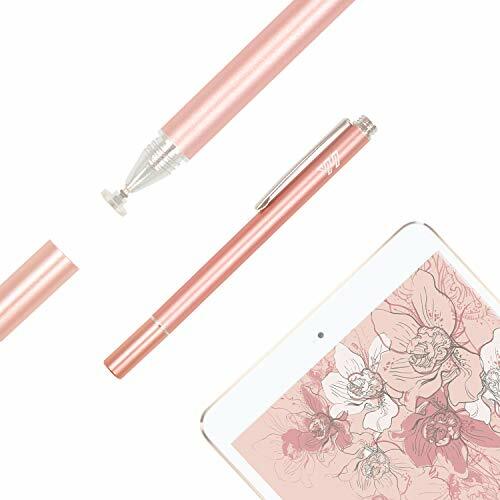 ✏️BEAUTIFUL & STYLISH: Aluminum alloy pen tube with metallic color Looks beautiful and stylish. ✏️COMPATIBILITY: Perfectly compatible with capacitive touch screen devices, including Apple iPad iPhone, Samsung Galaxy Note Tab, Kindle Fire, IOS Android tablets, touch screen smartphone, 2 in 1 laptops and computers. However, it's Not design for touch screen devices using other technology. For example, Surface is using electromagnetic technique for its touch screen which is different from general capacitive technology. If you have any questions about this product by YH-DIMENSION, contact us by completing and submitting the form below. If you are looking for a specif part number, please include it with your message.